Yeast infections of all types are becoming more and more prevelant, thanks to the use of antibiotics. Candida albicans infections are the most common type, and they can spread throughout your body. When yeast overgrowth becomes excessive, it contributes to a vast array of health problems, and is responsible for many of the immune system breakdown disorders we see today. Please read the following report for our suggestions on our suggestions of what we have experienced first- hand to be effective in combating candida albicans infections. One thing we recommend for anyone who has a candida yeast infection is to have a hair mineral analysis test done. One of the known causes of candida overgrowth is the presence of heavy metals in the body. A hair analysis can determine which toxic heavy metals your body has been excreting and can give you an excellent baseline before you embark on any type of heavy metal cleansing or detoxification program. The hair analysis also tells you which essential minerals your body is needing more of and which important mineral ratios are imbalanced due to heavy metals. Everyone has small amounts of yeasts and other negative microorganisms in the intestinal tract, which, when present in the right proportion, are relatively harmless. However, when the immune system is functioning below par, these microorganisms can multiply very rapidly and can start to spread to other areas of the body. Normally, a healthy immune system controls candida levels. However, certain circumstances can permit an excessive yeast overgrowth, such as high sugar consumption, prolonged use of antibiotics, elevated levels of mercury and other toxic metals in the body, the use of birth control pills, steroids, and cortisone, and excessive glucose in the bloodstream due to diabetes or insulin resistance. You can find all of these products in a good health food store. If you decide to take these products, they should be rotated for maximum effectiveness. With these products, it normally takes six months or longer of consistent use to measurably diminish systemic candida populations, and for best results, they should be combined with a strict anti-candida diet. First thing in the morning, before you put anything in your mouth, get a clear glass of water. Work up a bit of saliva, and then spit into the water. Check the water every 15 minutes or so for up to an hour. 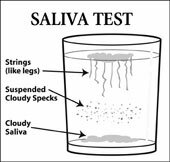 If you have a problem, you will see strings (like legs) traveling down into the water from the saliva floating on the top, or "cloudy" saliva will sink to the bottom of the glass, or cloudy specks will seem to be suspended in the water. If there are no strings and the candida is still floating after one hour, you probably have candida under control. A great product for killing off resistant yeast, as well as harmful bacteria, viruses and other pathogens, is colloidal silver. Dr. Ron W. Leavitt, Professor of Microbiology and Molecular Biology at a major university, did a comparative test between colloidal silver and antibiotics, using them against some of the deadliest bacteria known to man. The study concluded that colloidal silver performed equal to or greater than five major classes of antibiotics and killed every strain of harmful and resistant bacteria that even some of the most powerful antibiotics could not kill. Even though colloidal silver destroys the harmful pathogens, it somehow knows how to leave the good bacteria in your intestinal flora intact. In a separate humanitarian study in Ghana, Africa, medical doctors tested the effects with 120 different people suffering form common ailments, of which one was Candida Vaginal Yeast Infection. Of the 5 subjects studied with vaginal yeast infection, they all improved within 3 days, and were symptom-free within 5.6 days on average using colloidal silver. Toxic mineral ratios and toxic metal accumulation following long term or acute exposure can contribute greatly to degenerative conditions like candidiasis. A hair analysis provides a biological profile of the past 2 – 3 months of intracellular activity revealing a unique metabolic world which cannot be seen through most other tests. The hair mineral analysis gives you or your healthcare professional much-needed information about mineral deficiencies and chemical imbalances in your body, especially if you’re suffering from symptoms of any disease or disorder, including candida yeast infections. To purchase a comprehensive Hair Tissue Mineral Analysis (by Trace Elements, Inc.), please click here. Thank you for visiting our page on Candida Albicans Yeast Infections!